1 Departamento de Música da Universidade Federal de São João del Rei (DMUSI-UFSJ), São João del Rei, MG, Brazil. 2 Escola Municipal de Música Maestro Ivan Silva, Divinópolis, MG, Brazil. Anxiety is a manifestation with high prevalence in the population. The musical performance requires a high level of skills, making it susceptible to anxiety state1. Studies show an alarming incidence of about 50% of music performance anxiety (MPA) among professional musicians1-4. Literature data show a consistent difference between females and males (3:1 respectively)5. In the stress, there is a release of CRH in the hypothalamus, which determines an increase in the secretion of ACTH6-8. This study aimed to determine whether endocrine variables (cortisol and ACTH) could be related to gender differences in MPA. Figure 1. 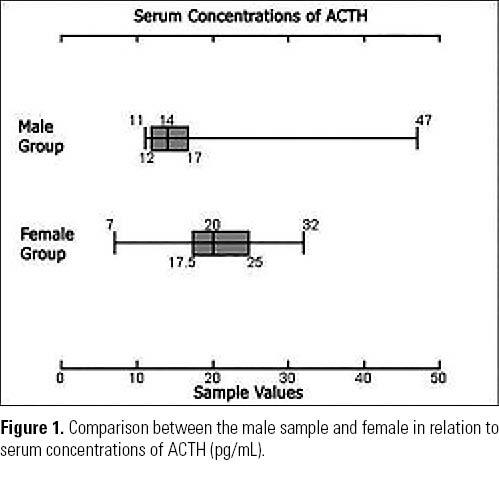 Comparison between the male sample and female in relation to serum concentrations of ACTH (pg/mL). The following inclusion and exclusion criteria were used: (Inclusion) – adult UFSJ (Sao Joao Del Rei Federal University) music students; (exclusion) – patients with a diagnosis or treatment of psychiatric diseases or uncompensated organic diseases. All the subjects completed and signed the Consent Term and Informed (TCLE), approved by the Ethics Committee of UFSJ. It was applied to version validated for the Portuguese language K-MPAI9, which aims to establish scores for the MPA. The higher the score, the more suggestive MPA. Scores of the 4th quartile of this population were considered high (≥ 136). For the 28 subjects (14 + 14 larger smaller) polar distribution, were made the blood samples to measure cortisol and ACTH. The samples were collected between 08 a.m. and 09 a.m., and the patients were instructed not to smoke, eat, or drink alcohol within 12 hours before the collection. The reference values adopted for cortisol were 05-25 ug/dL and the plasma ACTH 06-76 pg/mL. Statistical analysis sought to establish relations between anxiety levels, gender and cortisol and ACTH. Parametric tests were applied. ♂ = 14,68) (p ≤ 0.05) (Figure 1). The results indicate that the ACTH possibly has a role related to the MPA. 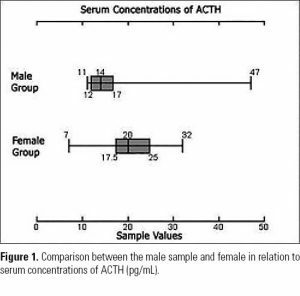 The discrepancy that occurred in relation to cortisol (Men > Women) could be explained as a function of the cortisol inhibit the HPA axis, with consequent inhibition of ACTH release in the male group8. It is expected that this study can contribute to initiatives aiming at the improvement of conditions in the psychic musical performance. Kenny DT. Music performance anxiety: is it the music, the performance or the anxiety? Music Forum. 2004;10(5):1-16. Kenny DT. A systematic review of treatments for music performance anxiety. Anxiety Stress Coping. 2005;18:183-208. Kenny DT. Music performance anxiety: origins, phenomenology, assessment and treatment. Journal of Music Research. 2006;31:51-64. Thompson WF, Bella SD, Keller PE. Music performance. Adv Cogn Psychol. 2006;2(2-3):99-102. Zalta AK, Chambless DL. Understanding gender differences in anxiety: the mediating effects of instrumentality and mastery. Psychol Women Q. 2012;36(4):488-99. Alves TCTF, Fráguas R, Wajngarten M. Depressão e infarto agudo do miocárdio. Rev Psiq Clín. 2009;36(3):88-92. Guest FL, Souza DM, Rahmoune H, Bahn S, Guest PC. Os efeitos do estresse na função do eixo hipotalâmico-pituitário-adrenal em indivíduos com esquizofrenia. Rev Psiq Clín. 2013;40(1):20-7. Young EA, Abelson JL, Cameron OG. Interaction of brain noradrenergic system and the hypothalamic-pituitary-adrenal (HPA) axis in man. Psychoneuroendocrinology. 2005;30(8):807-14. Rocha SF, Dias-Neto E, Gattaz WF. Ansiedade na performance musical: tradução, adaptação e validação do Kenny Music Performance Anxiety Inventory (K-MPAI) para a língua portuguesa. Rev Psiq Clín. 2011;38(6):217-21.